This feature is enabled on the database level. Though, I have strongly urged many to enable this by default by enabling it in the model database. That way every time you create a new database on a particular instance, query store will already be running. The query store is made up of 3 components. It’s great to have all this information in one location as opposed to gathering it separately with custom scripts. The remainder of this article will present some use cases for query store. It isn’t meant to be overly technical (we can save that for another post). Rather, it will give us good talking points, especially when it comes to justifying to management why your environment could use this feature. Why should I use the Query Store? Find out what was happening on my server last night? What happened on my server last night? Query store is great for a historical view of what your server was doing. It’s often referred to as “a flight data recorder”. Query store would have saved me a ton of time to find out what was going on and ideas on how to correct it. Not only that, but the fact that we can identify it so quickly means that we can prevent this from happening again. Once the query store is enabled you can look at the reports in the “query store” section of the databases. Please reference the image below. There are times when the Query Optimizer may choose a different plan due to certain values for parameters. And in rare cases, this new plan is not optimal for most inputs and thus gives us degraded performance. In the past, this was difficult to identify and remedy. Query store has empowered us as DBAs and developers. 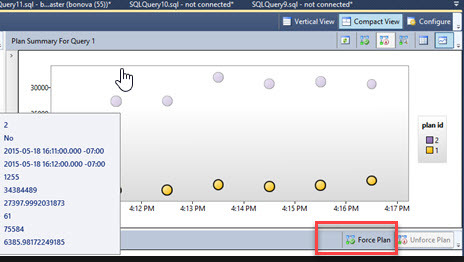 Utilizing the “Regressed Queries” option from SQL Server Management Studio can be used as a starting point for analysis. Now you have what SQL has identified as queries in which the execution metrics have been degraded. The graphical user interface makes it easy to see the multiple plans and which are more resource intensive. This visualization gives a starting point. From here you can see actual execution plan and make an educated decision as to which one you want to force (or not). In order to force a plan, it’s as simple as selecting the query plan and pressing the “force plan” button highlighted below. Identify multiple plans and then you can force one or the other. There are actually a couple of scenarios in regard to testing. One would be for an upgrade or migration project. Another could be for a development project. With a migration, you can do a dry run and then run a workload against a database with query store enabled in the old compatibility mode. Once that information is collected, set the databases compatibility mode to the latest and continue testing. Check the query store to see if there have been any plan regression and tune accordingly. Look at the top consuming queries and see if you want to tune them or force a plan or just gather a baseline of statistics and execution plans for the major store procedures and queries. Documentation is important, and we don’t do it enough. Gathering as much baseline information as possible early on will help tremendously as your database and workload increase over time. You can utilize query store to analyze resources such as CPU, I/O and memory at the database level. This will allow you to see the patterns early on see how it either deviates over time or if there is a onetime occurrence that shows a change in the pattern. This is an example of doing our due diligence as we prepare to migrate or upgrade databases to new versions of SQL. Take advantage of it, document it, and present it to management. As with the above paragraph, the same approach can be used when working on a development project. You can identify queries, parameter sniffing ahead of time and either tune the queries or force the plan before the go-live date. One disadvantage of Query store is that it is only available for SQL Server 2016 and later versions. But thanks to the Open Query store project, developed by William Durkin, this functionality has been made available to everyone on SQL Server 2008 and higher. Open Query store functionality is also included in ApexSQL Plan, a new, free tool for query plan analysis. I hope that you found this article informative. It was not meant to be overly technical, rather it’s intent was to give some ideas on how you can utilize query store in your environment. This is especially useful if you must bring it up to management so that they know how useful it will be to you as a DBA and in turn, how it will impact the business.